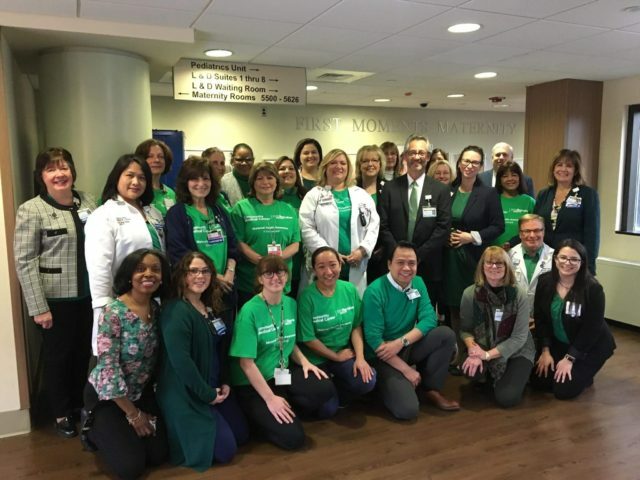 RWJBarnabas Health (RWJBH) marked Wednesday, January 23 across its system as the second annual statewide observance of Maternal Health Awareness Day. New Jersey is the first state in the nation to designate a day calling for action to raise public awareness about maternal health and promote maternal safety. The proclamation for Maternal Health Awareness Day in New Jersey was signed by Governor Christie in 2017. It was spearheaded by The Tara Hansen Foundation – created after the death of a New Jersey woman who died from an unnoticed infection after childbirth – as well as Rutgers Robert Wood Johnson Medical School and Rutgers New Jersey Medical School. The objective of the day is to increase maternal health awareness for all residents of the state including providers of women’s healthcare services, the general public, legislators, insurance company executives and other interested parties. The RWJBarnabas Health’s OB Collaborative meets regularly to identify best practices, review and implement evidence-based protocols, address challenges, and evaluate and implement ways to improve maternal care. For example, to help address complications of hypertensive disorders of pregnancy, which is one of the leading causes of maternal morbidity and mortality, the OB Collaborative created a bundle that includes a standardized order set and care pathway to support physicians and residents in clinical decision making to improve maternal care. The bundles were created using guidelines and recommendations from The American College of Obstetricians and Gynecologists and are currently being implemented system wide. The work includes advocacy before lawmakers, community engagement through institutes and coalitions, and leading obstetrical care for all. As a result of the OB Collaborative, the majority of RWJBarnabas Health hospitals offering ob-gyn care have reduced their C-section rate, about half are now below the national episiotomy rate, and all hospitals are below the national early elective delivery benchmarks. RWJBarnabas Health has also partnered with several outside organizations to improve maternal outcomes across the state, including: the NJ Department of Health Maternal Mortality Review Program, the Alliance for Innovation on Maternal Health (AIM), the NJ Perinatal Quality Collaborative led by the NJ Hospital Association’s Health Research and Educational Trust and the State of NJ Maternal Mortality Case Review Team.RWJBarnabas Health is also actively participating in the ‘Stop! Look! Listen!’ maternal health and safety campaign developed by the Tara Hansen Foundation to help empower pregnant mothers and their loved ones in addressing maternal health and safety and encourages women and families to speak up if they feel something is wrong – and providers to take heed of those concerns. In recognition of Maternal Health Awareness Day, facilities across the RWJBH system hosted various education events for health care providers and the community to help increase awareness of maternal health issues within the communities they serve.